Toque-me, Sou teu say signs stuck on free-to-use public pianos in Sao Paulo, Brazil. Play Me, I'm Yours, say similar signs in Birmingham, UK and Sydney, Australia. 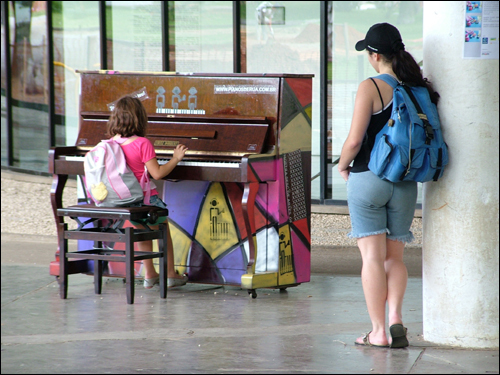 Dozens of pianos placed in public areas in those cities tempt passers-by of all ages to sit down and play their favorite pieces, for the benefit of anyone who stops to listen. Delighted audiences soon gather, often dancing to the music, or chanting the songs. 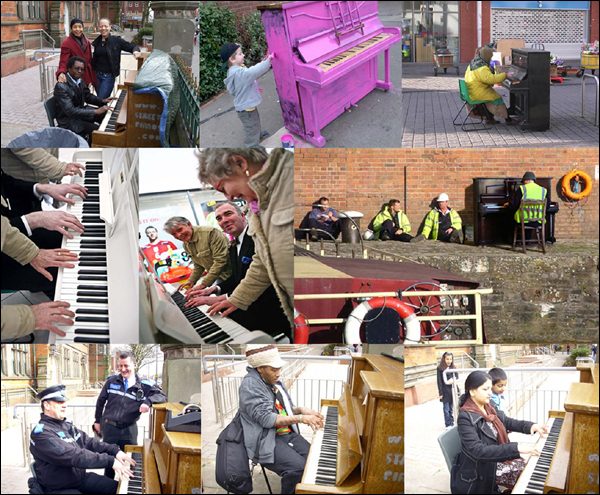 Public pianos were the brilliant idea of Luke Jerram, a British inventor, installation artist and science communicator. He designs and builds science exhibits whilst creating multimedia installation artworks in his home country and overseas. In March 2008, 15 pianos which had been professionally tuned were installed, unguarded, in Birmingham, Britain's second city. "There is one in the Rag Market, and one outside Cadbury World," Maev Kennedy reported in The Guardian. "There is another at Colmore junior school, where a teacher was persuaded into an impromptu recital dressed in white gown with veil fluttering in the icy wind. She had been on her way to her wedding." 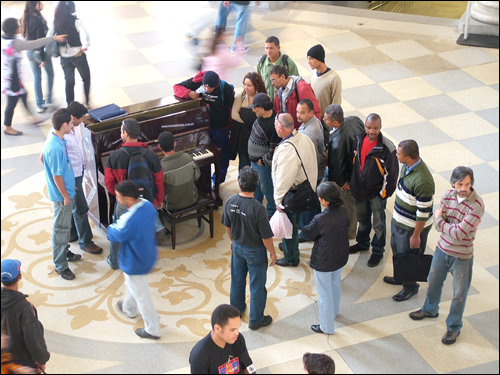 Six months later, Jerram installed 13 pianos in Sao Paulo, Brazil. The music-loving South Americans responded enthusiastically. "At ￡1,000 each (a year's wage for some people) many people had never seen a real piano before, let alone been given permission to play one," Jerram said later. "The project made national news there." Two clips from Sao Paulo TV: /(speech in Portuguese). The most incredible, something that would never think that, (never seen in my 10 years of musical studies) a beggar (tattered and dirty, exhaled a smell that instigated people to come out of that person close) sat at the piano and incredibly started playing the first notes of the Moonlight Sonata (Beethoven). In January 2009, Jerram visited Australia for the Sydney Festival. He arranged for 30 pianos to be bought, tuned, and installed in parks, public squares, on Harbor ferries and even in a tattoo parlor, for anyone to play. The novel idea drew raptures from the press, radio and TV, and proved to be one of the most popular features of the festival. Thousands of pianists - ranging from accomplished musicians to complete mugs - happily tickled (or thumped) the ivory (or plastic) keys. "Whether it's Chopsticks or Chopin, chances are you'll hear it on the streets of Sydney this summer", said Rebecca Baillie in an ABC-TV 7.30 Report. A youthful-looking Jerram told her, "I'm hoping these pianos will act as a catalyst to get people talking to one another, to kind of connect people." Sydneysiders' comments, videos and photos are posted on this Web site www.streetpianos.com.au. Jerram is so enthusiastic about the project that he has set up a special fund so that public pianos can be installed in "less wealthy" cities, including San Paulo. He sees public pianos as an important way to promote community harmony. "The pianos act as sculptural, musical, blank canvases that become a reflection of the communities they are embedded into," he says. "Who will play them and how long they remain is up to each community." "Questioning the rules and ownership of public space, 'Play Me I'm yours' is a provocation, inviting the public to engage with, activate and take ownership of their urban environment." 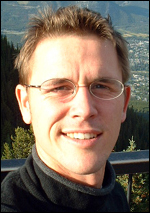 Jerram lives in Bristol, UK with his partner Shelina Nanji and children Maya and Nico. He has been described as "a colour blind installation artist, who fuses his artistic sculptural practice with his scientific and perceptual studies." He has an impressive academic career fully described in his biography. Luke Jerram wanted to avoid a traditional proposal, so spent three months developing a ring that would play: "I love you forever. Marry me." Once it was ready, complete with a miniature record player, he took Shelina Nanji up in a hot air balloon and, while the pilot discreetly looked away, asked for her hand. She is now his fiancee. It seems that Luke Jerram is both a gifted and a gift-giving performance artist.